FEXCO is Ireland’s most successful multinational financial and business solutions provider with operations in 29 countries. The company operates four contact centres serving a diverse customer base. FEXCO's journey with Teleopti started by signing an agreement and just a few months later the schedules of over 460 contact centre staff were loaded onto the system, fully operational. Initially deployed for the purposes of automating agent scheduling and adherence activities, the benefits of the Teleopti solution have since been recognised and appreciated by other parts of the contact centre and its value extended beyond the resource planning department. 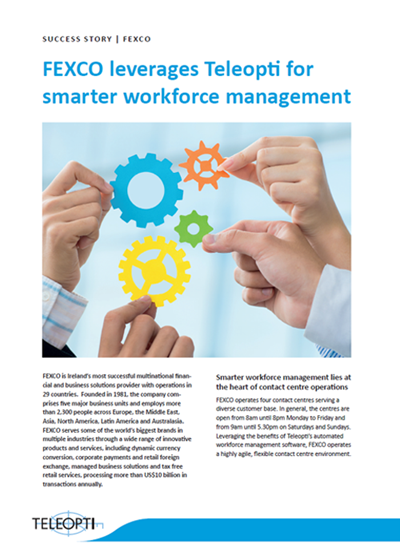 Read the rest of FEXCO's journey from the implementation of Teleopti WFM to their exciting plans for the future.